The new kits arrived this week as modeled by Taylor Cahill in the picture above! They are blue in padded short sleeve and orange in padded long sleeve. I will have a picture up of the orange soon. I coach 45 goalkeepers weekly around Wicklow and every single one of them can get themselves unlimited amounts of free gloves by wearing their Just4keepers kit around County WIcklow. For example, Taylor plays a league match this weekend. The opposing keeper sees his jersey and calls me asking about J4k. 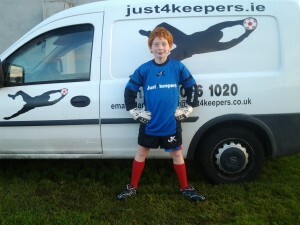 Taylor has just got himself a free pair of gloves when this new keeper joins our goalkeeping academy in Ireland!!! THIS IS UNLIMITED!!! Wear it training for your club, for your school team, at GAA training or anywhere you think there might be a chance for someone to see that you attend weekly goalie training for kids in Bray or Wicklow.